One of the common statements I hear from classical guitarists is “yesterday my nails sounded great and today…not so much, but I don’t know why!”. Over the years as I work with students at the New Zealand School of Music, in master class situations and privately, I’ve become aware that certain equipment and filing techniques are consistently successful. This workshop will cover basic nail shape, the action of the nail on the string, different nail types and strategies for shaping, nail care equipment (preparation), diet/ supplements, and repairs. ​Featuring a step-by-step video with close-ups, this workshop will show you how to prepare your nails for maximum tone production. Please bring: guitar, footstool/support and the following nail equipment (no fancy buffers, crystal files etc. needed!). ​​NB nail equipment – the length and quality of the nail file, and the type of sandpaper are crucially important. The sapphire nail file pictured is only sold at Countdown super-markets and is far better than the Manicare (etc) files commonly available in chemists. We will talk about how to prepare the nail file for use, which involves sanding the file with sandpaper. Through years of trial and error I have found Norton (avoid Flexovit! 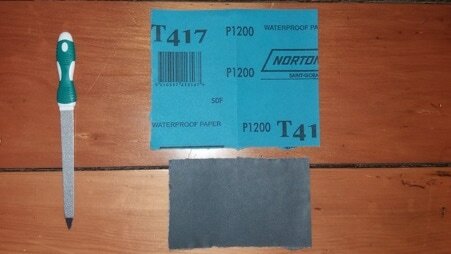 )T415 waterproof P1200 to be the best sandpaper in terms of consistency and finish for both myself and my students – this sandpaper can be found in most Bunnings/Mitre 10 hardware stores.